The Federico Garcia is in great condition, as it is rarely played. It's had only one owner prior to me (my Father), and I've taken very good care of it over the years so it's quality and condition is exceptional. New strings will be provided with the guitar, as well as it's own hardshell case. You can contact me at: rca5009@gmail.com. I check my mail constantly so reply will be provided within the day. My Garcia No. 1, 1970, is labeled as "Assembled in Japan". I bought it new in '73 or '74 for $225. It had a small nick on the soundboard, so was marked down from $275 I believe. My recollection is that the No. 1 was the lowest grade and the No. 3 the highest. I recall that the store had a No. 2 that was priced higher than the No. 1s but that was a long time ago. I had never heard the story about the labeling scandal until recently and I can't complain about the quality or sound of mine. Obviously, they haven't increased in dollar value over the years but I agree they are very undervalued at today's prices of $200-$300. I recently acquired a 1970 Garcia No. 1 with a lovely rich tone, very happy with it. Paid $200 with original case (from pawn shop), and guitar is near mint. While the lower level models (grade 2 or 3) may be cheaper, I thik the grade 1 models are undervalued in the marketplace because of the allegations of fraud as to source. As to those claiming their 1967 guitars from this maker appear to have come from Spain, I think that is correct. This is based on reading a lot of internet articles over the past month. From what I've read (and note this could be mistaken) Sherry-Brener imported guitars from Spain initially, had some kind of falling out with the Spanish guitar maker they were using, then switched to doing "assembly" in Spain. I read that happened in 1969 or 1970. So I think any models before 1969 probably WERE made completely in Spain and imported from Spain. My own, 1970, was probably one of the Japanese assembled, but I cannot be 100% sure. It was around 1973 that some authorities forced Sherry-Brener to put "assembled in Japan" on the label of these guitars. So even though 1970 - 1972 models may not say that on the label, they were apparently assembled in Japan. It would be interesting to now the EXACT date assembly moved from Spain to Japan. If it was sometime in 1970 (rather than 1969) I guess it is conceivable my own Garcia was made entirely in Spain. But I'm not so hung up on that issue, since it does not change how my guitar sounds, how well it stays in tune, how it lacks any fret buzz, etc. I own a Federico Garcia too, mine say built in 1967, i found it at a goodwill back in 1996, i paid 50 bucks for it, it's still in the original wooden case with the original key!! !, i love it, it sounds soo nice!! i would never depart from it!!!! My Garcia has a label inside saying "Madrid," and a hand-written 1966. I bought it in 1967 for $180 from Cotton Music in Hillsboro Village, Nashville. 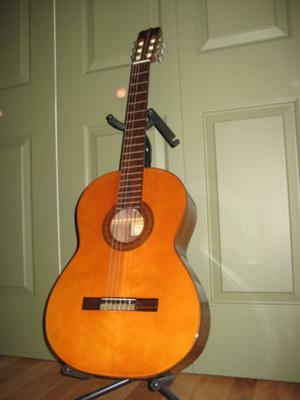 I had a nice Gibson, but my newly acquired manager, Chuck Glaser insisted I get a classical guitar to match my voice. I played badly, and I'm afraid that's still true. I'm glad it had a hard body case, because I took off to join what was left of the hippies in San Francisco. I traveled all over California, getting a gig wherever I could. It has a few scratches, but sounds better every year. It has only had three machines and a hand-carved nut. I like using a wound 2nd string. I love my guitar. I have a Garcia number III that says it was assembled in Japan. I have read that all of the Garcias like mine, of around that vintage, were built there, as well. I bought mine new in 1970 for $100 and both then and now its tone is unmatched by anyting I have played (I have played a couple of guitars since). Not sure about the Spanish labels business - mine never had anything like that. I have seen guitars like mine listed for $2000-3000 whenever I have seen them for sale. Maybe a different Garcia than this conversation but if so, you should check to see which one you have. I've enjoyed reading all the opinions on these guitars. Luckily, the Internet provides a vast source of information. Problem is, how the heck do we know what, if any of it is reliable information? My interest in the Federico Garcia guitars goes way back to when I'd only been 'picking' a few years. I wanted to upgrade my generously handed-down Harmony classical guitar. Since I didn't have much $$$ or anyone to help chip in, my options were limited. I found my Garcia in a little music shop in Madison, TN, bordering Nashville, TN. There was a blemish in the finish so the owner allowed me to use the guitar until he took delivery of the next shipment. Like I said, this was a small store, maybe 100 or so guitars. A couple months later, as promised, he got another shipment of Garcia guitars -- all '2' of them. I paid the final $50 of the $150 purchase, & was on my way. I'm not concerned with the history of, or the rumors about, or any of the so-called technical crap. Suffice it to say, my Gibson Les Paul's sound & play better than the Epiphone models that pretty much look the same. Probably why they cost about 20-to-1 as much $$$. I'll gladly leave the 'smart talk' to the people who know that sort of stuff. My little Federico Garcia made it around the world a few times during a military career. Never fell apart so I guess it was constructed to last. Lost it in a nasty divorce & have wanted another one ever since. She didn't play the thing, just didn't want me to enjoy it. Anyway, the Garcia's sound well, hold tune well, & travel well. Their value is a relative matter. Do you like it or not? I just found & bought the same model & year Federico Garcia I used to have, but haven't received it yet. This one cost $400 sight unseen, so I guess it's worth that much to at least one person. Sorry to ramble on. Most people reading these things want some facts. Okay, my Federico Garcia was bought new in 1967 for $150. The tag inside said it was made in Madrid. If it wasn't, somebody went to the trouble of printing the 'country of origin' as "Spain" on the cardboard box it came in. Oh yeah; it also had a U.S. Customs stamp verifying clearance from Spain. Maybe it was all a ruse? All I know is I loved the thing & just paid $400 to replace it. Even though I haven't seen it yet, I feel I got a bargain. When I read these things, people usually like to talk about what they know. I don't know squat! I'm just a retired U.S. Air Force Master Sergeant. I am blessed & fortunate to have some nice toys; a pair of 57 Les Pauls - a Black Beauty 3PUP, & a Goldtop. I like playing the 62 Fender Jazz Bass, too. And the 69 Strat is fun. They're all left-handed so it took a while to find them. The Garcia? I just restrung the thing & hand-carved a lefty nut for the neck. I don't think the guitar ever minded -- it sounded great. I'm sure the one coming will too. Y'all take care. I own several Garcias's not to mention Hernandis which was also part on the Mr. Brenner scam that sadly affect all this instruments many of them have a beautiful intonation and nice balance on the registers but not a quality to pay 2000.00 dollards for. I pay from 125.00 to 300.00 at my maximun on Garcias 1a's and I consider myself very lucky if I can sale it for more than 250.00. Federico Garcia is a false luthier. Sherry Brenner in Chicago had this fake Spanish labels made. He imported these cheap guitars from Japan. Quite a character.